U.S. manufacturers are facing heightened concerns over rising costs and tightened operational regulations, according to a recent report from BDO USA, a professional services firm. Many manufacturing firms were also concerned about changing Environmental Protection Agency compliance and environmental risks. New and changing risks for manufacturers underscore the importance of adequate risk assessment procedures. Small-business manufacturing firms saw the uncertain economic climate as a risk. The industry is considered a driver of job growth, but some companies saw underfunded pensions and retirement benefits that lead to rising costs as risks, and some manufacturers were facing a shortage of skilled workers. "While many manufacturers want to expand or even bring back U.S. operations, there are still significant challenges," said Howard Sosoff, manufacturing and distribution practice leader at BDO USA. "Manufacturers are looking long and hard at their cost containment practices to offset the rising price of conducting business in the U.S., while also exploring opportunities to expand abroad - likely in locations with attractive corporate incentives." Manufacturers were particularly worried about international suppliers being vulnerable to natural disasters, terrorism and shifting foreign currency exchange rates. Firms were highly focused on improving efficiencies, reducing costs and maintaining access to raw materials. Are small businesses prepared for risk? Small-business manufacturing firms expressed natural disasters as a top safety concern, but 60 percent have not reassessed risk management procedures, a recent Staples survey revealed. The study found there was a disparity between firms' perception of risks and strategies for emergency preparedness. 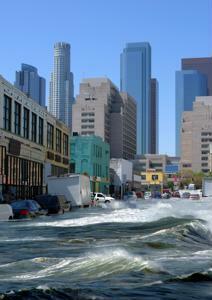 Less than half of companies were prepared in the event of a natural disaster or other emergency. Small businesses were at a much higher risk of an operational disruption due to lack of preparation than larger companies. Many firms were not reassessing their plans despite significant natural disasters within the past year. After Superstorm Sandy last year, more than half of New York small-business owners suffered significant business disruptions. Entrepreneurs lost revenue and were forced to temporarily close businesses. Despite the large impact from the storm, many New York owners reported they would be prepared to handle another unexpected natural disaster, according to a Bank of America Small Business Owner report. Some owners said they would be able to sustain their organizations without outside financial assistance for up to four months after another natural disaster, extended power outage or significant staffing change. Small-business owners in the areas affected by Superstorm Sandy were more prepared than others to manage a potential operational disruption. Small-business manufacturers may face a greater risk of data breaches than larger firms because they often do not have the IT infrastructure to support security, Manufacturing.net reported. Many companies use multiple data security solutions, and this can create IT complexity and raise costs. Smaller manufacturers may not take data risks into account because they may not believe they would be targeted by a cybercriminal. As technology continues to change, the risks facing smaller manufacturing firms could increase. Employees who use data systems within the company should be educated on potential data risks so they can take an active role in prevention. In preparation for a potential business disruption, smaller firms need to be sure to back up data, according to the Staples study. Extended power outages can cause important information to be lost, and backing up regularly can ensure data is protected and accessible in the the event of a natural disaster.